Brilliant red seeds with an earthy, woody flavor and vibrant colour. 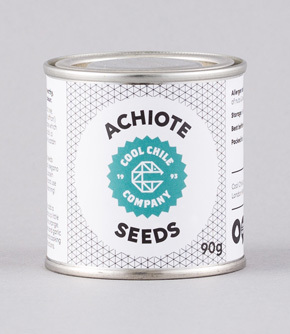 Harvested from the annatto tree, achiote seeds (‘poor man’s saffron’) are often ground into a paste which is a key ingredient in pork pibil, a traditional recipe from the Yucatán in south-eastern México. For yellow rice, add a teaspoon of Achiote Seeds to a little oil and gently fry until it turns orange. Remove seeds, then fry onions and garlic before adding rice and water and cooking as per the rice packet instructions. Grind soaked seeds with garlic, vinegar, Mexican oregano and salt to make a paste. Loosen with orange and lime juice and use to marinate meat or fish. Warning! Stains everything red.